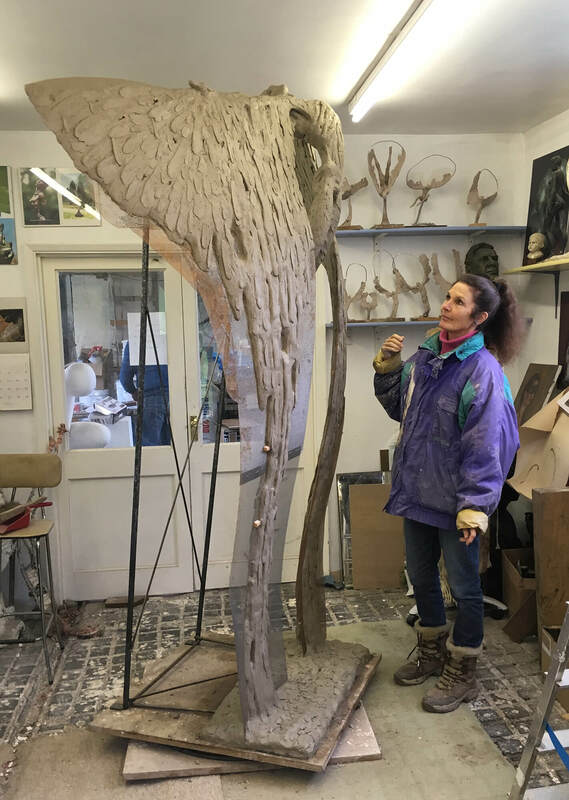 I have had over 30 years experience as a sculptor working in plaster and clay for bronze sculpture casting. Over the years as a bronze sculpture artist, I have worked on many site-specific public artworks with property companies and other organisations. My first large sculpture commission was the Hammersmith Man figure in 1988 and my most recent large bronze sculpture was the Icarus sculpture for the Olympic Village in London in 2012. The bulk of my work has been my private work of various sizes exhibited in galleries in the U.K, Ireland and the USA. My artwork is nearly always based on the human figure whether in an abstract form or in a realistic way. With my sculpture I have always wanted to work from the human form because of the feelings and emotions it conveys; there is usually a story behind every piece. My artwork has changed enormously over time and gone through many phases depending on what has been happening in my life and where the inspiration, to make sculpture, has come from. For example, during a marriage break up, my work changed from the calm, smooth and serene ‘Mother and Child’ and ‘Couple’ works I had previously been doing to pieces full of energy and angst which reflected my feelings at that time. There have been many other changes since. Ideas to create sculpture come from anywhere. Creative ideas can come from seeing a piece of flint or bone found while out walking, or even from a dream, some mythology or something briefly half seen while travelling somewhere. The ‘Eve’ and ‘Torso’ series of bronze figures began when I picked up a beautiful piece of flint that looked rather like a female torso. I began by making a very small figure hardly bigger than the original stone and then did the series of figures which got larger and larger. I made the original larger artwork in plaster as it is possible to create the smoothest of finishes. I enjoy people wanting to touch the finished work. I create the original pieces of sculpture in clay or plaster because it is fast and I like to get the ideas out quickly. I start with a metal supporting armature and use aluminium wire to produce the rough shape I am after and go from there, usually adding clay or plaster as fast as I can. I rarely draw my ideas before working as I like to keep the spontaneity and get ideas as I work. Most of my finished artwork is cast in bronze. Light reflects well off the surface and it can be irresistible to touch. Casting bronze is complex and time consuming and I try to be involved at each stage of the process; this metal is timeless and has its own fascinating history and, of course, should outlive us all. Over the last few years I have been excited by the mythological figure of Icarus and have produced a series of ‘Icarus’ pieces. These ideas began when I was learning how to fly (in an Ikarus C42 fixed wing microlight) and the combination of man and wings is so compelling that I can’t see an end to this period. I have made eleven sculptures of Icarus so far.